In Neapolitan cookery, the term scapece generally refers to an ancient method for preserving fish or vegetables. 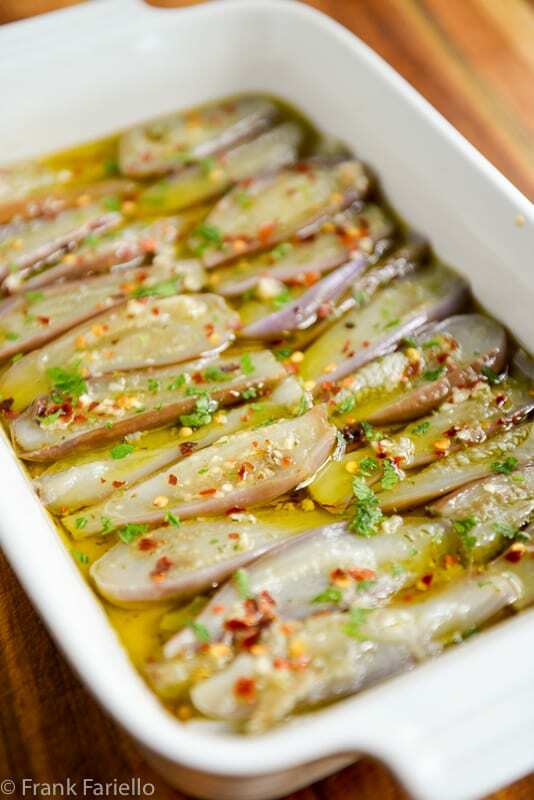 The main ingredient is generally fried in olive oil and marinated with garlic, mint and vinegar. We’ve already featured zucchini a scapece, perhaps the best known of this class of dishes. Today’s scapece recipe from Francesconi’s La cucina napoletana, on the other hand, treats the eggplant a bit differently. Rather than being fried, it’s boiled until tender, then marinated in abundant olive oil, garlic, oregano, red pepper and a surprisingly small amount of vinegar. 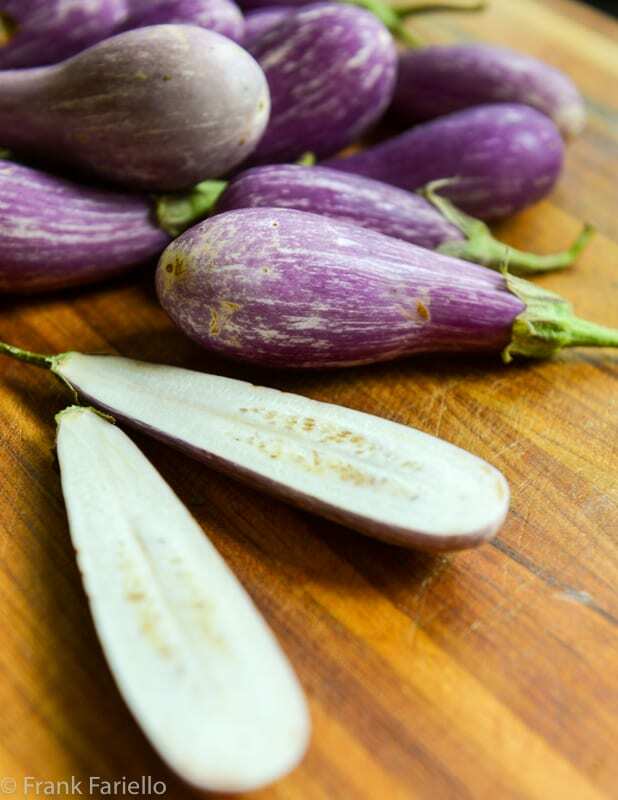 This alternative method takes full advantage of eggplant’s affinity for olive oil, but the pre-boiling ensures it doesn’t soak it up like a sponge, as raw eggplant is wont to do when it’s fried or sautéed. The result is a dish that’s lighter and less tart than the usual scapece, while every bit as tasty. Perhaps tastier, in fact, if my experience is any guide. Marinated eggplant is usually served as an appetizer, but when I made it the other day I ate so much it wound up as dinner, together with a nice chunk of crusty bread and a piece of fruit afterwards. Trim off the stems of the eggplant and, depending on their size, cut them into quarters or halves (or thick slices, see Notes). 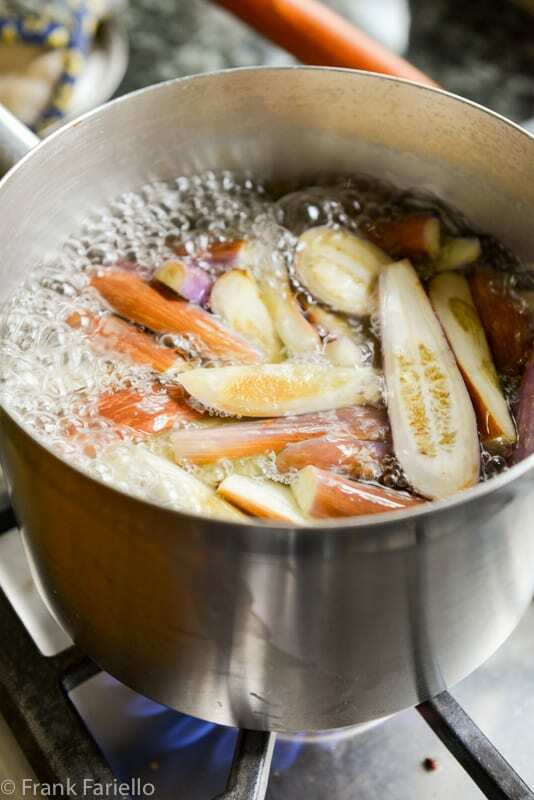 Bring a big pot of well-salted water to the boil and drop in the eggplant pieces. Boil until tender but not mushy. Meanwhile, mix the marinade ingredients together in a mixing bowl. Taste for seasoning. If you think it needs it, add more salt, red pepper and/or vinegar to get the taste you like. The mixture should be very savory but not overwhelming. When the eggplant is tender, remove to a colander and let drain and cool off. When the eggplant is cool enough to handle, gently squeezing out any excess liquid with a paper towel, lay the pieces out in a baking dish or other shallow receptacle. Spoon the marinade over the eggplant. It should not quite cover the pieces. Marinate for at least 2-3 hours. Serve the eggplant, if you like sprinkled with minced parsley and additional red pepper flakes for color and piquancy. Perhaps a light sprinkling of salt, too, if it needs it. Francesconi’s recipe calls for “small” eggplants, but she probably didn’t have in mind the beautiful baby eggplants I found in the farmers market last weekend. Her recipe calls for cutting the eggplants in quarters and boiling them for 20 minutes. These guys needed only to be cut in half and were perfectly tender after only 5 minutes’ boiling. You can adjust the recipe to suit the size of the eggplants you have on hand. I bet it might even work for standard sized eggplant; I’d slice them horizontally into thick rounds and proceed from there, boiling them probably no more than 5-10 minutes. Compared with your typical scapece, the taste of this marinade is not very tart, which I quite like—and here I’ve upped the amount of vinegar a bit from Francesconi’s original recipe. If you enjoy tart flavors, of course you can add even more vinegar. In fact, a few drops of vinegar just before serving would add a pleasant kick, I would think. Francesconi rather sternly warns that one shouldn’t eat the eggplant any earlier than the next day, but that may depend on the type of eggplant you’re using. These baby eggplants were perfectly delicious after only a couple of hours. In any event, they’ll keep for up to a week. Remember that the scapece marinade was originally a way of preserving in the days before refrigeration. But if you do refrigerate them, remember to bring them back to room temperature before serving. Of course, eggplant can also be made following the same technique you would use for zucchini a scapece: frying eggplant slices and pouring over a marinade of vinegar, garlic and fresh mint, with no additional oil needed. Trim off the stems of the eggplant and, depending on their size, cut them into quarters or halves (or thick slices, if large). Definitely want to try this, I always chargrill then dress eggplant. Definitely worth a try. This has a “softer” taste that’s quite nice, although grilling also has great flavor, of course. This was a huge hit Frank! Served it as an antipasto alongside a platter of assorted cured meats, with home-made loaf caramelised onion and herb ciabatta. My wife was a bit sniffy at the prospect of “boiled pickled aubergines” as she saw them, but they were delicious and a great counterfoil to the rich meats. None of my guests had ever seen this style of cooking before but were sure keen to finish off the whole dish! many thanks for the introduction and keep up the great work with the site. It is a please to visit you each week! I’m with you, I could very happily make a meal of this eggplant. What kind of eggplant is best for this? It looks like you are using the smaller graffiti eggplant, which I love. But can you use the larger purple for this? Yes, that’s the kind I used. But the recipe could work with just about any kind, including the larger purple ones, sliced. Thanks, Cristina. Hope you get over that jetlag soon! What a gorgeous dish! I’m going to keep my eyes peeled for baby eggplants. As you say, you could do it with any size, but the baby ones make such a stunning-looking dish! What an interesting recipe, Frank! You’re right that eggplant tends to soak up oil like a sponge, so I like the idea of boiling it first. These sound delicious! And they’re a perfect way to use summer produce, too. I hope you had a great time in Sicily, and I can’t wait to hear stories from your trip! They’re coming, David… Thanks for stopping by! In my edition, too, but I thought it would be good if the marinade almost covered the veg. Plus, I like oil. 😉 Was pleased with the results so reflected it here. Glad you liked the dish! Hope you enjoy the recipe, Eha—and I’m actually pretty sure will. 😉 Thanks for signing up for the newsletter. And no worries about missing anything, all those posts are still here for your perusal! … I found some eggplant at the market today that aside from having purple skin, looked much like a zucchini. Following your recipe, I served them as a side w a baked in paper filet of corvina, topped with fresh pesto and sun dried tomatoes. Perfect together! Never would have guessed eggplant that way! And BTW, since you’re off to Sicily, I’ll add that before dinner, with a cocktail, I had some Sicilian sheep’s milk cheese, made with arugala and capers, a specialty cheese I’ve never seen before. I give that cheese a wow too! Thanks Frank! Have fun! Have a great trip Frank! Looking forward to seeing your follow up posts! one to try, never had it. thanks. I can’t wait to try this recipe. My husband does a great job barbecuing long Japanese eggplants. Would they work for this recipe? Have a great time in Sicily and tell us about it when you come back. I’m sure those long Japanese eggplants would be excellent. My only advice would be that they would probably only need a very short boiling time, being as delicate as they are. If you try them this way, do let us know how they turned out. Ma che buone! I have never tried this dish, it looks fantastic! Vacation in Italy sounds wonderful, take a cooling cloth (found at sports retailers) because Italy (Spain and Portugal too) is experiencing record temperatures! Looking forward to seeing your food adventures! This recipe looks delicious, I can just imagine how creamy the eggplant becomes and how lovely it is on crusty bread, I cannot blame you for making a dinner of it. Looks great. Nonna always made a similar dish, more like a quick pickle of eggplant fingers with bay leaf and garlic in white wine vinegar. I know now she boiled the eggplant first. But her dish used no olive oil at all and was delicious. Any ideas on a recipe? Sounds like a sott’aceto dish. I don’t have a recipe on this blog but here’s one from the late (and great) Kyle Phillips. And I bet that Domenica Marchetti included one (or more) in her recent Preserving Italy, if you have that book. Reminds me I should definitely go a post here on that method soon! Oh I love those small eggplants you found to use in this recipe, which I will definitely try once my eggplants are ripe. I like to make eggplant sott’olio too, where they’re boiled in part water, part vinegar, then put in jars with oil. Have a great time in Sicily, one of my favorite places in Italy. I look forward to your posts when you return. Love this! Such beautiful eggplants, made even prettier! Love the addition of cayenne as well. fantastic looking recipe which I am going to try tomorrow! thanks for sharing Frank! Hope you like it, Letizia! And thank you, Ethel, for your kind words. Very happy to hear you’re enjoying the blog! Lovely looking dish. And I’d definitely use the smallest eggplant I could find — no way could I wait overnight before sampling those beauties! Thanks for this. And have a wonderful time in Sicily! This looks fabulous, Frank, thanks for sharing. I’m heading off to your zucchini recipe in a moment as I have a courgette glut, but before I do, a quick question … when you say red pepper flakes, do you mean what we’d call chilli flakes on this side of the pond? Thanks again and have a great holiday, Linda. Yep, the same thing. Thanks! Looks fantastic, Frank! I’m hoping we’ll have enough good weather to harvest my own eggplant. I’ll definitely try this. Have a great time in Sicily! I’m growing eggplant and I’m hoping to be able to harvest some before it cools off too much for the fruits to develop. It’s a race against time in Seattle. I’m saving this recipe to try. 🙂 Have a fabulous time in Sicily! The baby eggplants have been incredible this year in our market, too. I usually buy 6-8 each week and always make the same one or two recipes with them. Time for a change! I have never tried making anything “scapece” and look forward, especially, to this eggplant version. Buon viaggio, Frank! I will have to touch base with you when you get back to see if you have any suggestions/discoveries for our trip to Sicily in October. Best wishes for a good happy vacation. Don´t forget to tell us about it when you come back ! Thanks so much, Ana Maria! I really like this one Frank. I’m a huge fan of eggplant so this certainly makes my table. Now if I could just find some of those beautiful purple ones in your image. Have a wonderful and safe Sicilian holiday.